Messier 34 is an open star cluster in the constellation of Perseus. 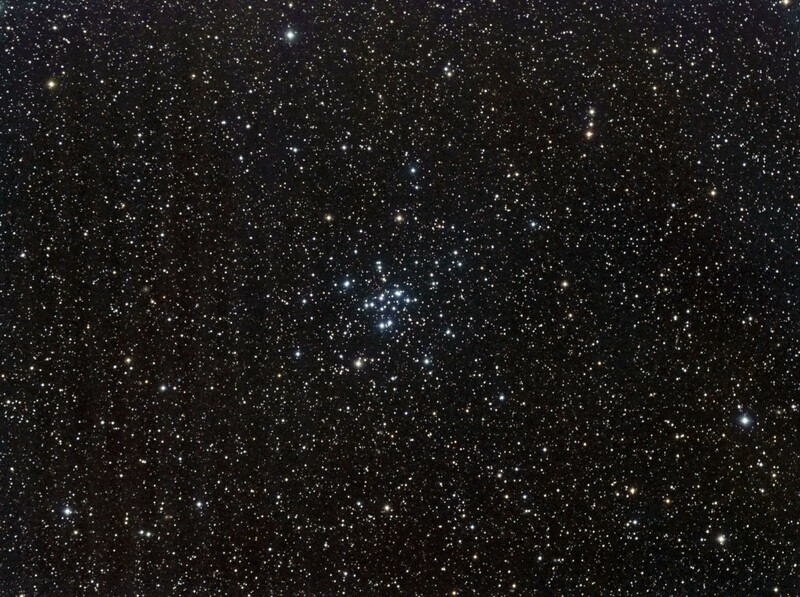 It is one of the closest Messier objects at about 1,400 light years and contains about 500 stars. The blue stars in my image are some of the newest stars in the cluster and make up a small part of the cluster. The rest of the cluster contains stars that are older such as white dwarfs that have lost the ability to fuse hydrogen. It is the range of stars that fall in to and off from the Hertzsprung-Russell diagram that indicate the age of star clusters. As I was processing this image I noticed several small spiral and elliptical galaxies in the background. There was even a small planetary nebula in there! I compared my image to a star chart and labeled them in the image below. One thing that stood out was that these galaxies were all labeled in the PGC (Principal Galaxy Catalog) catalog and are in the 15-18 magnitude range. The image below is annotated with the galaxy names that I could find but there are still several other galaxies in the image that I could not identify.